In honor of Valentine’s Day we are sharing love stories this month. We’re kicking things off with a two part series from Aden and his fiance, Josh. We’ve followed Josh’s story since he first came out, and it’s great to see him so in love. Tomorrow we’ll hear Josh’s side of this love story! If you have a love story for the Keshet blog, let us know! Celebrate all kinds of love with our queer Jewish Valentines! I first met Josh when I was on a date with my previous partner. A friend of ours had asked if we had wanted to go to a Keshet Shabbat dinner and we obliged. After the service concluded we sat down with a couple of strangers and began talking. I remember telling Josh about my switch from going to school for Unitarian Universalist ministry, and then finding Judaism. I told him that sometimes, there are things that are unexplainable, that cannot be reasoned, and that is where faith in God begins. As I was leaving the Shabbat dinner that evening, I remember thinking “wow, if I were not with my current partner, I would totally date this guy”. In April, my relationship of over four years, began to unravel. For the next six months, my ex and I were on and off. During one of our breakups, I had begun online dating, not looking for anything too serious. In early October, we officially ended our four year relationship. I met Josh, again, just a few weeks after. Our first date was amazing, we talked about the intersection of queer identities and religion. We were so engrossed we walked roughly 5 miles. At the end of our date we sat outside, and I gave him a little kiss on the cheek. Prior to this I had been in only heteronormative relationships, and was terrified of being perceived as visibly queer. I was afraid to give up any of my privilege that came with being in what was perceived as a normative relationship. 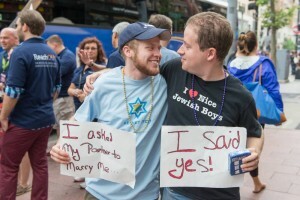 Our third date was my conversion ceremony; Rabbi Zecher of Temple Israel of Boston asked how Josh and I knew each other. I hesitantly explained “we’re dating.” I was reluctant to put a label on us that would make this a real relationship. Despite my best efforts to run, I found myself falling in love with Josh. I loved going to shul with him on Friday nights, debating scripture, and spending holidays with our families. After six months of dating, I began to look into rings. I tried desperately to talk myself out of this proposition. I had always viewed fast engagements as irresponsible. I could not reason this feeling away. I truly believe that our love is beyond time and beyond reason. Pride season is Josh’s favorite time of the year. He talks about it in all seasons of the year and usually marches with Keshet. So, one night while out at a bar Josh and his family, listening to Josh’s uncles’ band, I found myself asking Josh’s cousin what she was doing the day of the Pride Parade. I had decided in that moment to go for it and make a proposal during Pride. I gave myself two weeks to buy a ring, plan the proposal, and to ask for his parents’ blessing.
. Nothing could have ever prepared me for the embrace of our community. The whole route, we were congratulated on our engagement, and I was truly beaming. Before this moment Pride was simply the “Queer Fourth of July,” yet I now see it as time to make the invisible visible. I cannot be more proud of our relationship, our love, and our faith. I look forward to sharing our next part of our Jewish journey.